Here, at Lilypad farm, we have finally made the Cross over… from Dow blue board to LiliPad ™ raft. 2′ x 4′ x 1.3″ thick. Have 12 tapered holes per raft which equals 48 holes per 4′ X 8′ area. The geometry is identical spacing to the UVI model with one exception. We moved to a 3 inch cup, allowing The highest quality food possible. The output of a 2 inch net pot or cup is not equal to a 3 inch net pot. With 3 inch pots, we have posted healthy plants for over 56 months. When a seed pack reports 10 ounce average. The plants here post 14-16 oz. By using a 3 inch pot or cup, it just works! When a plant needs the room to grow, it gets to fruition quicker -larger here, year round. When a plant is too small or too close together the plant matter displays numerous signs of weakness leading to insects and other problems directly placing the harvest at risk. Also consider that we use a high density(fish) stocking and(fish) feed rate. This makes for a higher free and available nutrients period. We are confident you too will get the same results if you follow the UVI method of stocking and plant spacing. High-production is the result. We display and sell the largest or the large!!!! 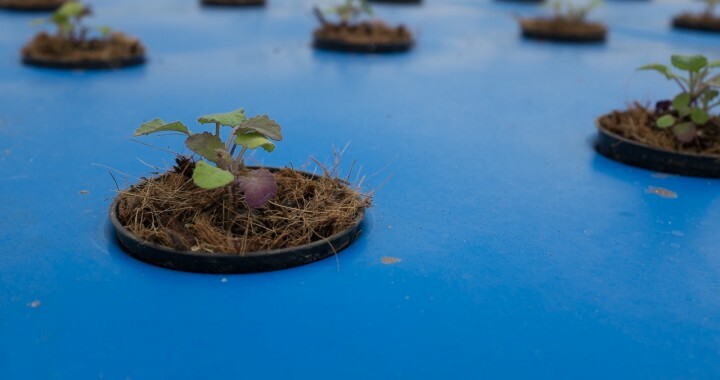 – week in, week out – making the profits we need to sustain Lilypad Farm. Our move to the “poly raft” – LiliPad Raft ™ – strategy last month was to an even better result than first thought. Each raft is 2’x4’x1.3″ making it fast and easier to harvest and load cutting down significantly on labor! This modified chore set makes for even higher profits here! Buying lifetime rafts vs. buying “blue boards” every 24-30 months. These new poly LiliPad Rafts ™ come with a lifetime no question asked guarantee. It is the #1 raft of it’s kind. Yes, it is 3 inch holes and we have a 2 inch coupling that works also if you prefer. Please ask me any questions here about the change over. We’re convinced that this is a no brainer decision when considering lifetime costs and reduced labor costs. We are happy to tell you the reasons we choose LiliPad Raft ™ over Styrene. These rafts are the Best hands down. Wholesome is the first answer. No fear or concern around chemicals leaching from the foam or pieces breaking apart and strying in system. The second is lifetime replacement. They will replace the raft for free. They just want to know “HOW in the world did it break”. 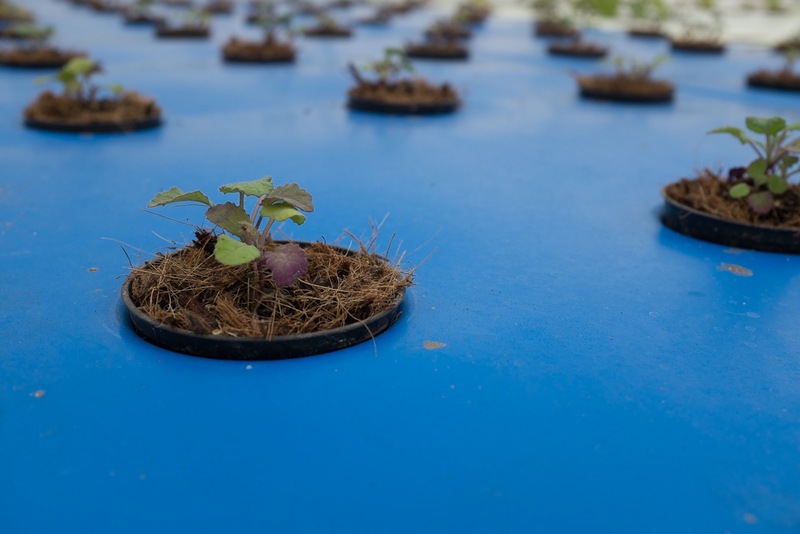 let me ask you a question, what do you think about the use of polystyrene (Dow blue board) in aquaponics systems? I have some reports about the danger of fire retardants in this material, what is the Global Aquaponics opinion on the subjet?? do you know if this material releases chemicals into the water?? what about on organic certification?? The use of ‘Dow blue boards’ is only a temporary solution. They do, in fact, contain chemicals used in the production process that will leech into your aquaculture system. They are also not very durable and tend to get brittle and decay after the first few crop rotations. The organic certification is a different story; for the short time we used blue boards, we were unable to get many required certifications. That is the primary reason we developed the Lili Pad Raft. It uses FDA approved food safe plastic, is highly durable, and comes with a lifetime warranty. You can find them for sale on this site or on amazon.com. They are already pre-approved for food production.